When Phil and Anne Dade were building their dream home in View Royal, they wanted something different from the very traditional house they were leaving behind in New Brunswick. With its use of sustainable materials, soaring ceilings, open concept plan, and abundant windows offering stunning views of trees and water, this modern sanctuary is the realization of that goal. 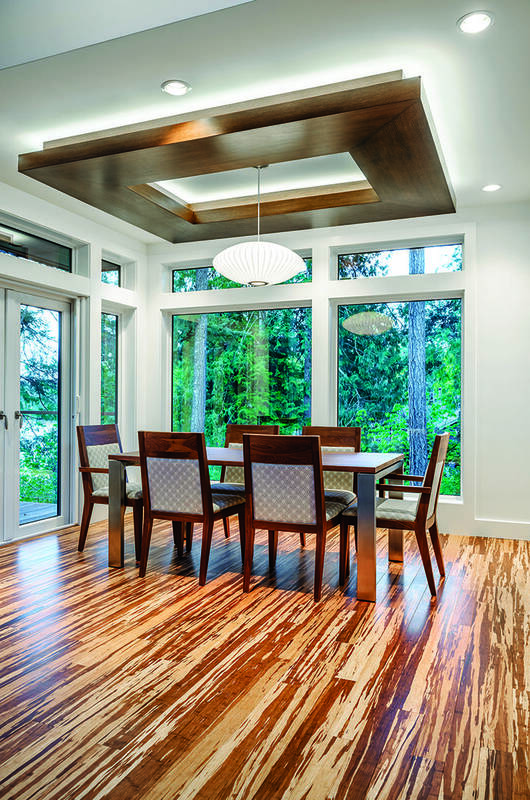 The dramatic striped bamboo flooring was designer Tamara Bush’s eco-alternative to the exotic floorings the owners loved. Triangular Flos Fucsia 1 suspension lamps over the kitchen island add an element of contrast by breaking up the boxy shapes and lines throughout the open space. The vision for the hillside home was a creative collaboration between the owners, Keith Baker of KB Design, Christopher Walker of Christopher Developments, and Tamara Bush of InHabit Designs. Baker describes the aesthetic as “contemporary Pacific West Coast style,” which he acknowledges means different things to different people. The ceiling canopy — a feat of ingenuity which transforms the heavy wooden structure into something which looks light and floaty — helps define the dining area and frames the Modernica bubble lamp from Gabriel Ross. 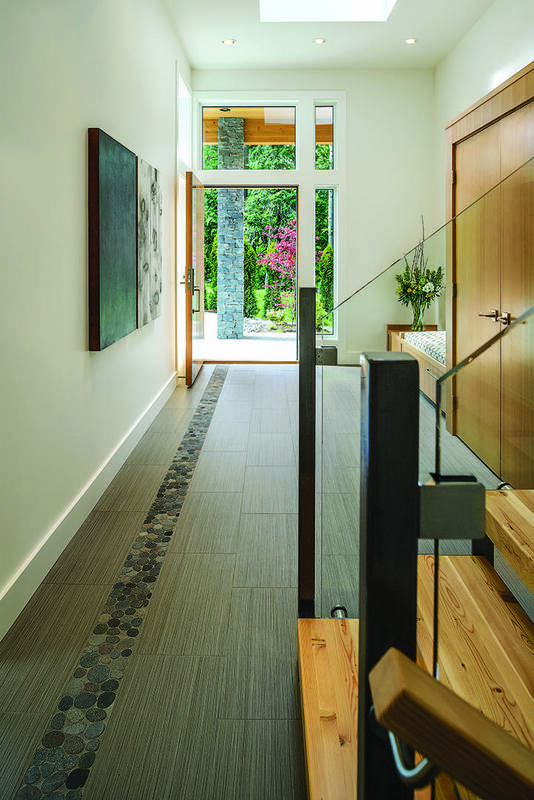 The outside of the home, which uses a simple palette and sustainable materials such as recycled cedar, local stone, acrylic stucco, and polished concrete complements its natural surroundings perfectly. 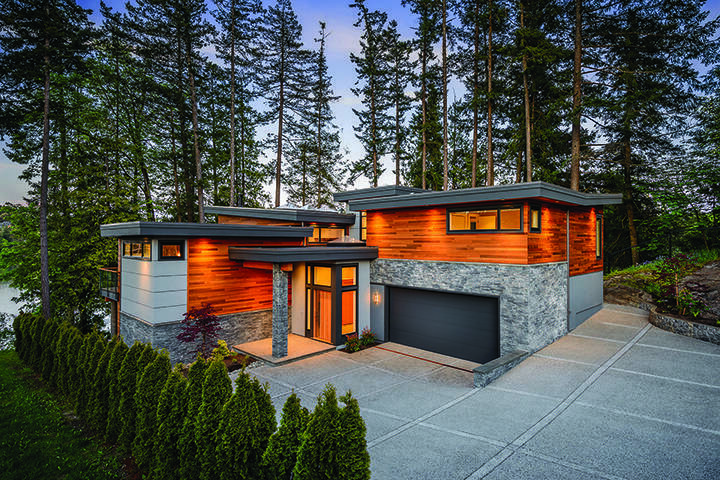 Its West Coast-inspired design was recently a Victoria Home Builders Association CARE award silver finalist for Best Single Family Detached Custom Home over 3,500 square feet. 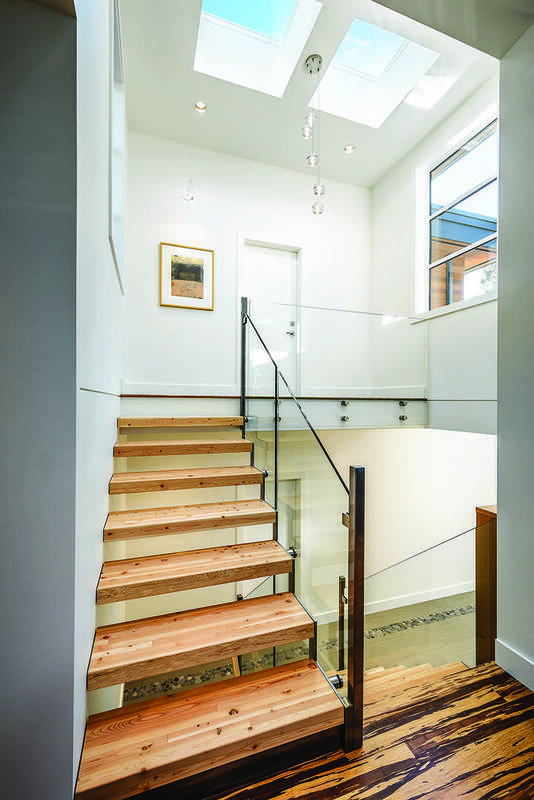 Baker is especially proud of the entranceway, a “welcoming space that gives one a feel for the rest of the home.” Numerous skylights over the floating stairs — an architectural element designed by Walker — allow rare natural light to flood into the north-facing basement. The driftwood marble floor of the inviting foyer contains an inlaid pebbled stone path that lines up perfectly with the stone pillar outside the front door. Serene artwork by Cheryl Taves and stunning built-in furniture complete the space. Luminosity is the unifying theme throughout the Inlet. 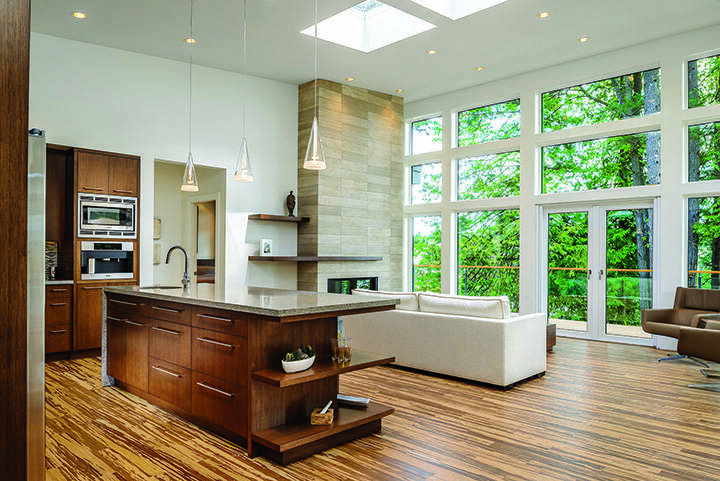 Light floods into the space from the full-height windows and skylights. With its unique floors adding colour to the space, and the muted palette of whites and natural materials, it truly is a jewel of a home. 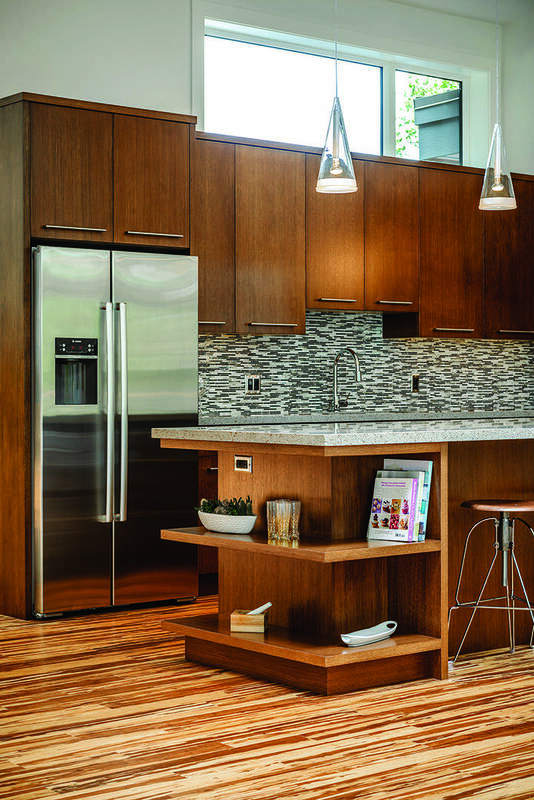 A glass tile backsplash adds an interesting graphic element that plays off the flooring and the walnut-stained oak cabinets by Hobson Woodworks. Floating shelves at the end of the island echo the floating shelves on the fireplace in the living room. 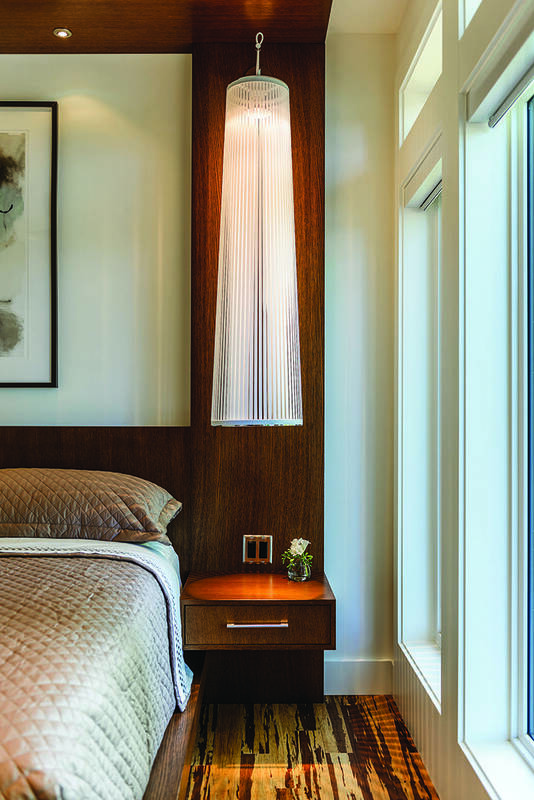 Oversized Pablo Solis suspension lighting from Only Human and a lofty custom headboard by Bush emphasizes the height of the ceiling in the bedroom. 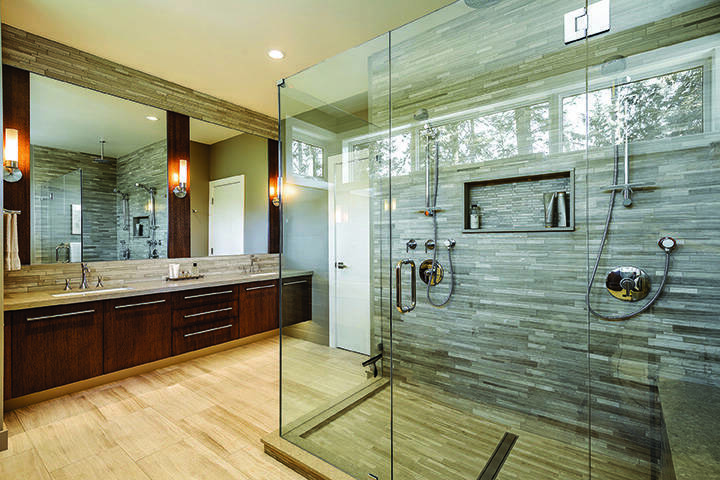 Natural light fills the en suite bathroom, which is dominated by a double-head shower in forest marble. The patterned flooring could not be used on the stairs, so Walker used a complementary natural wood. The risers are suspended from the tempered glass with brackets, and paired with the hanging Bocci lights from Only Human give the space an airy character.